Surplus ammunition is great for the range, but if you want to take your Mosin-Nagant or PSL out into the field and bag some trophies, you'll need something that will bring down game more reliably. 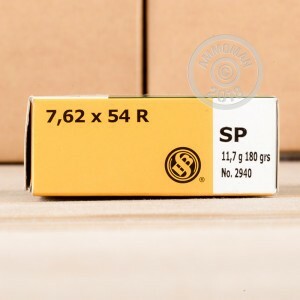 These 7.62x54R cartridges from Czech manufacturer Sellier & Bellot can help you get the job done. Each round in this box of 20 fires a 180 grain soft point bullet at a muzzle velocity of about 2,600 feet per second. The soft point bullet delivers expansion without fragmentation--the perfect combination for clean kills on deer and other animals. These rounds use brass cases as well as non-corrosive Boxer primers--after all, the last thing you need to worry about when stalking a buck is soaping down your barrel. Spend more than $99 at AmmoMan.com and save with free shipping! 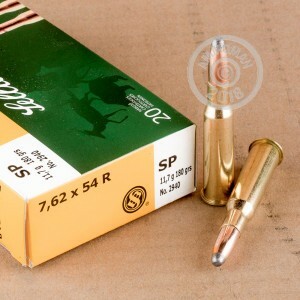 7.62X54R SELLIER & BELLOT 180 GRAIN SP Satisfied. 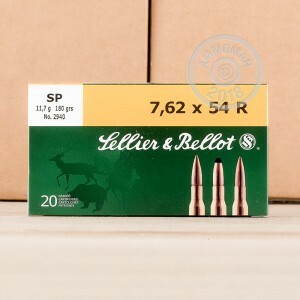 I've used Sellier & Bellot ammo for years. Overall satisfied.